Part of the group of lions in Taiz Zoo. Source: Taiz Zoo. The lions are in the town of Taiz, Yemen’s third-largest, which has been besieged by Houthi rebels for months. Dozens of civilians in Yemen have been killed in fighting between Houthi rebels and forces loyal to the government. Physically the lions are in very bad shape and are literally starving, says Drew Abrahamson, who has rescued numerous lions and is trying to help facilitate the redemption of the cats. “In a country ravaged by conflict, the animals come second,” she added. Four Paws International is helping drive the effort, and negotiations are under way to try and get the agency into the zoo to assess the animals. Four Paws is also involved in trying to get animals out of the zoos of Gaza, where they are also in dire conditions and have no food. 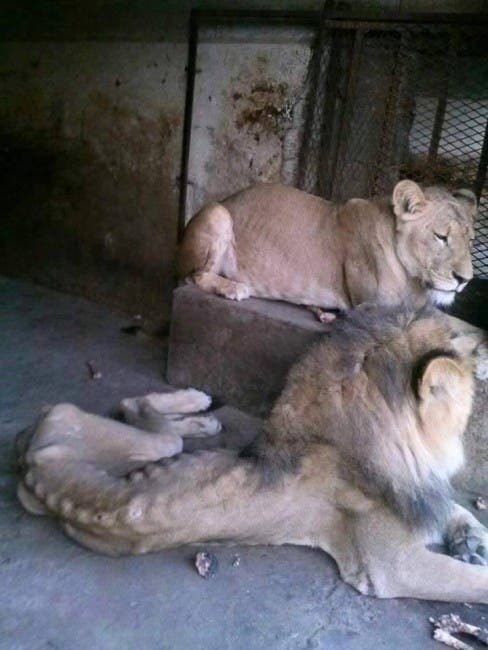 The international agency would probably bring the lions to South Africa, the same way they did late in 2015 when they rescued lions from a zoo in Romania. Abrahamson said she didn’t think the Yemen lions would be strong enough to travel. At least one lion from the group has died, on 28 January. Contributions to Four Paws can be made here. Next articleWho Are the Guptas and Why Does Malema Want the Gupta Family Out of South Africa?